I came back towards the grotto and started taking off my stockings. I had hardly taken off the first stocking when I heard a sound like a gust of wind. Then I turned my head towards the meadow. I saw the trees quite still: I went on taking off my stockings. I heard the same sound again. 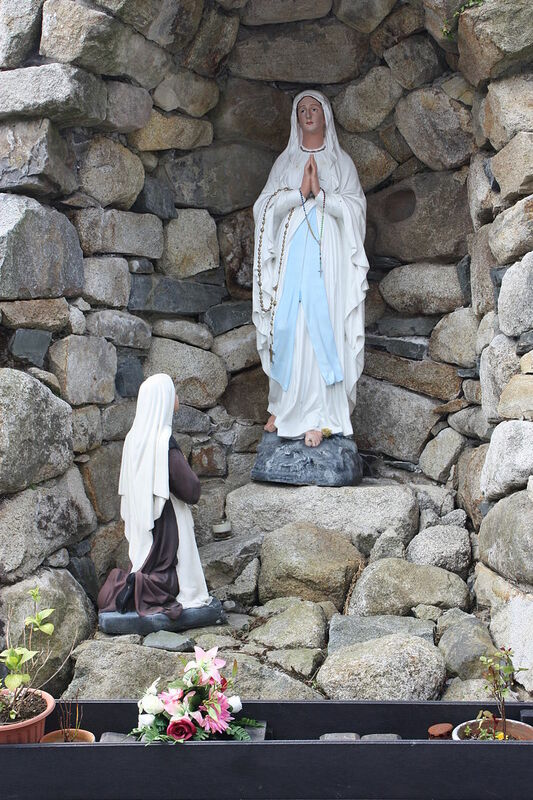 As I raised my head to look at the grotto, I saw a lady dressed in white, wearing a white dress, a blue girdle and a yellow rose on each foot, the same color as the chain of her rosary; the beads of the rosary were white….From the niche, or rather the dark alcove behind it, came a dazzling light. Soubirous tried to make the sign of the Cross but she could not, because her hands were trembling. The lady smiled, and invited Soubirous to pray the rosary with her. Soubirous tried to keep this a secret, but Toinette told her mother. After parental cross-examination, she and her sister were beaten for telling lies. Then I started to throw holy water in her direction, and at the same time I said that if she came from God she was to stay, but if not, she must go. She started to smile, and bowed … This was the second time. Soubirous’ companions are said to have become afraid when they saw her in ecstasy. She remained ecstatic even as they returned to the village. 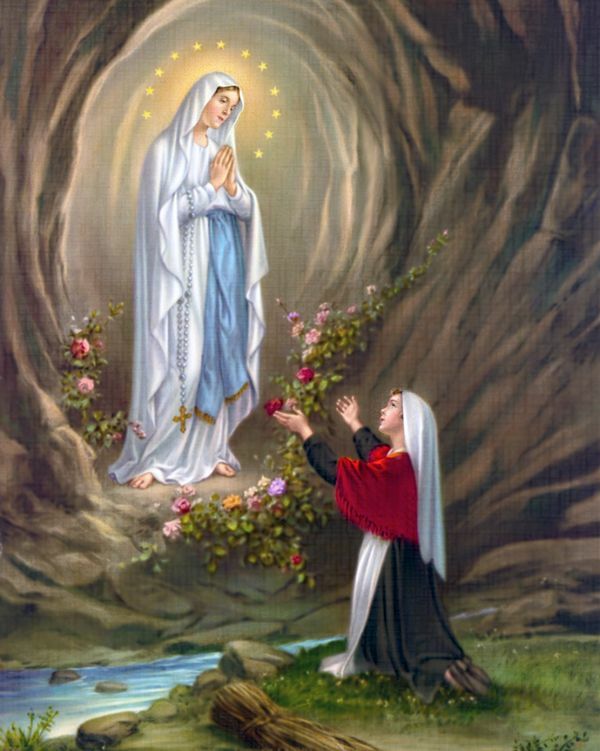 On 18th February, she spoke of being told by the Lady to return to the Grotto over a period of two weeks. She quoted her: “The Lady only spoke to me the third time. … She told me also that she did not promise to make me happy in this world, but in the next.” Soubirous was ordered by her parents never to go there again. She went anyway, and on 24th February, Soubirous related that the apparition asked for prayer and penitence for the conversion of sinners. The next day, she said the apparition asked her to dig in the ground and drink from the spring she found there. The digging made her unkempt and some of her supporters were dismayed, but this act revealed the stream that soon became a focal point for pilgrimages. Although it was muddy at first, the stream became increasingly clean. As word spread, this water was given to medical patients of all kinds, and many reports of miraculous cures followed. Seven of these cures were confirmed as lacking any medical explanations by Professor Verges in 1860. The first person with a “certified miracle” was a woman whose right hand had been deformed as a consequence of an accident. Several miracles turned out to be short-term improvement or even hoaxes, and Church and government officials became increasingly concerned. The government fenced off the Grotto and issued stiff penalties for anybody trying to get near the off-limits area. In the process, Lourdes became a national issue in France, resulting in the intervention of Napoleon III with an order to reopen the grotto on 4th October 1858. The Church had decided to stay away from the controversy altogether. Soubirous, knowing the local area well, managed to visit the barricaded grotto under cover of darkness. There, on 25th March, she said she was told: “I am the Immaculate Conception” (“que soy era immaculada concepciou”). On Easter Sunday, 7th April, her examining doctor stated that Soubirous, in ecstasy, was observed to have held her hands over a lit candle without sustaining harm. On 16th July, Soubirous went for the last time to the Grotto. “I have never seen her so beautiful before,” she reported. The Church, faced with nationwide questions, decided to institute an investigative commission on 17th November 1858. 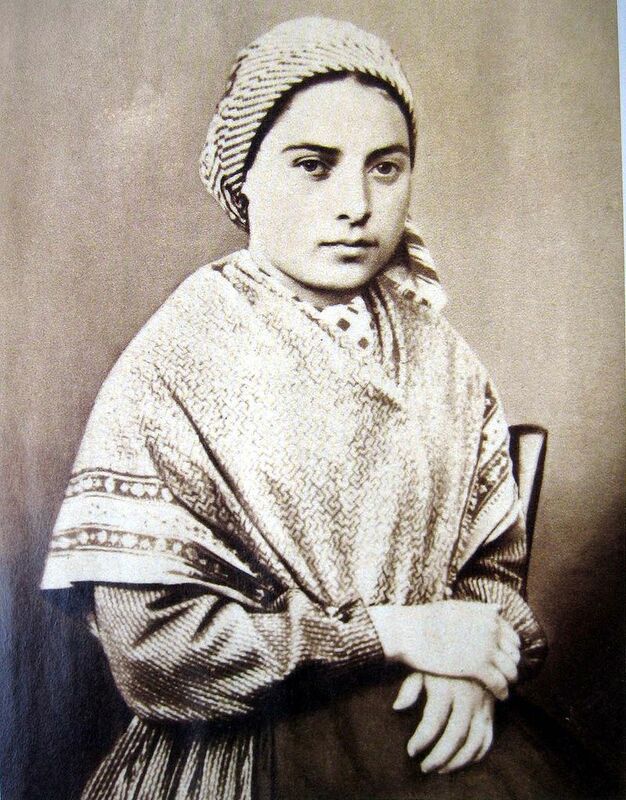 On 18th January 1860, the local bishop finally declared that: “The Virgin Mary did appear indeed to Bernadette Soubirous.” These events established the Marian veneration in Lourdes, which together with Fátima, is one of the most frequented Marian shrines in the world, and to which between 4 and 6 million pilgrims travel annually. In 1863, Joseph-Hugues Fabisch was charged to create a statue of the Virgin according to Soubirous’ description. The work was placed in the grotto and solemnly dedicated on 4th April 1864 in presence of 20,000 pilgrims. The veracity of the apparitions of Lourdes is not an article of faith for Catholics. Nevertheless, all recent popes have visited the Marian shrine at some time. Benedict XV, Pius XI, and John XXIII went there as bishops, Pius XII as papal delegate. He also issued an encyclical, Le pèlerinage de Lourdes, on the one-hundredth anniversary of the apparitions in 1958. 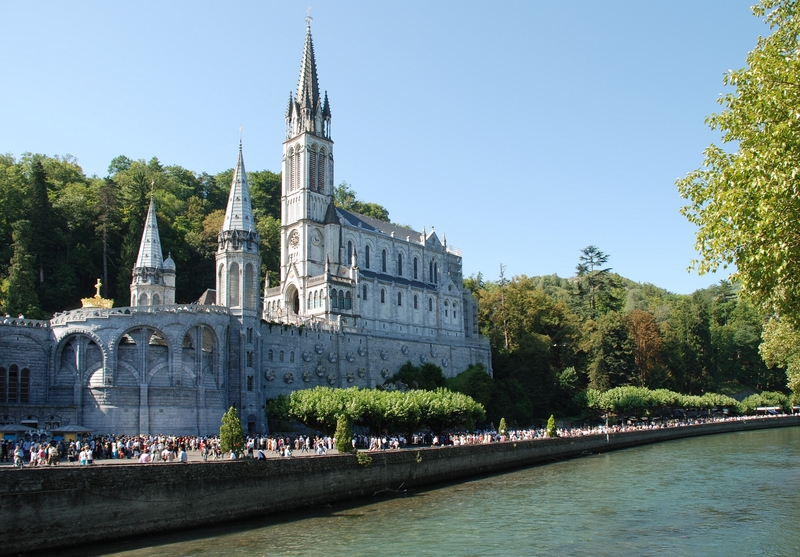 John Paul II visited Lourdes three times during his pontificate, and twice before as a bishop. Lourdes and the Occitan region are noted for many dishes, but for a poor peasant girl I have chosen the simplest: touradisse. 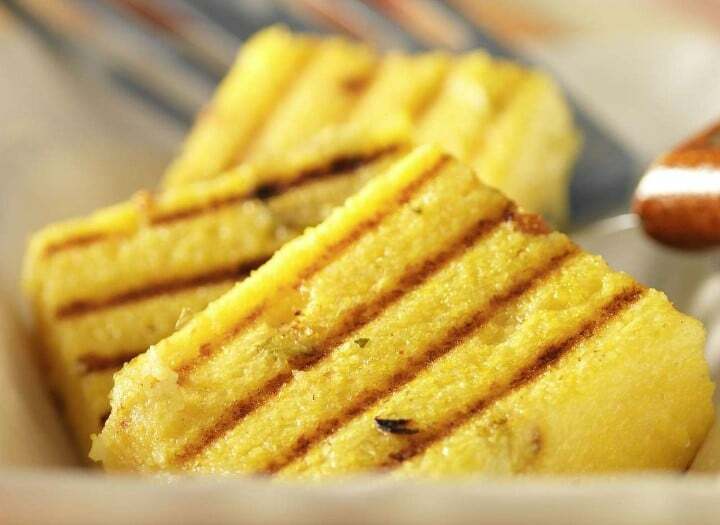 It is similar to polenta, and can be made in different ways. For many families it was their sole dinner dish, and it was made in a pot over a fire – stirred for hours until thick. This recipe is quicker and more modern (and convenient) – more like cornbread. Grease a deep 8 x 8 inch pie pan. Mix together the cornmeal and wheat flour in a large bowl. Stir in the milk, eggs, vanilla extract, salt and butter. Stir well until all the ingredients are completely mixed. Pour the mix into the pie pan and bake for 40 minutes, or until the top is springy and a toothpick inserted in the middle comes out clean. Serve warm in squares or slices.